Urbanization is quickly migrating populations back to cities where they once thrived before suburbia's growth beginning in the 1950s. In just 15 years, 60% percent of the world's people will live in cities, a 10% increase. As city populations grow, so will traffic jams, which already cost commuters around the world up to 100 hours in wasted time annually, according to an INRIX study. In order to get above the noise and pollution of congested city life, Airbus plans to produce the first working prototype of a self-driving flying car by the end of next year. "In as little as ten years, we could have products on the market that revolutionize urban travel for millions of people," Rodin Lyasoff, project executive at Airbus's A³ group in Silicon Valley, said in an article on the Airbus website. "Many of the technologies needed, such as batteries, motors and avionics are most of the way there," Lyasoff stated. What's still needed is reliable sensing and object avoidance technology, which is next on A³ group's plate. "That's one of the bigger challenges we aim to resolve as early as possible," Lyasoff said. Under the project name Vahana, A³ has been developing an autonomous flying vehicle platform for individual passenger and cargo transport. Airbus's Helicopters division has also been working on a design that it believes could meet regulatory requirements. Airbus said executives were not available to offer further details of the autonomous flying vehicle project. Launched in May, A³ by Airbus Group is a skunkworks unit of sorts whose aim is to run a small portfolio of projects designed to foment industry disruption, according to remarks made at its launch by Paul Eremenko, CEO of A³. The organization sees itself as a private version of the Defense Advanced Research Projects Agency (DARPA), the research arm of the U.S. Defense Department. Eremenko joined A³ after leaving Google, where he was director of engineering in its Advanced Technology and Projects (ATAP) group. At Google, Eremenko led the development of Project Ara, a modular smartphone. One hurdle any self-driving flying vehicle must overcome is government regulations, which are only now catching up to small unmanned drones, never mind flying cars. And, "no country in the world today allows drones without remote pilots to fly over cities - with or without passengers," Bruno Trabel from Airbus Helicopters, said in the company's blog. Trabel is lead engineer on Airbus Helicopters' Skyways project, which "aims to help evolve current regulatory constraints." Earlier this year, Airbus Helicopters and the Civil Aviation Authority of Singapore (CAAS) signed a memorandum of understanding allowing Airbus Helicopters to test a drone parcel delivery service on the campus of the National University of Singapore in mid-2017, according to the company. 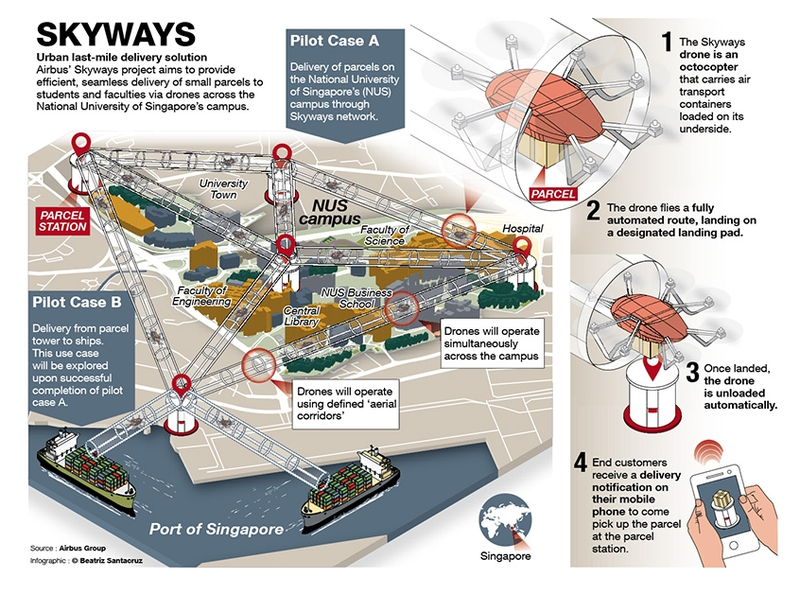 "We need to prepare for the greater use of unmanned aircraft in our urban environment to help address the new and future needs of our society," Kevin Shum, director-general of CAAS, said at the time. "We want to facilitate their use by industry and the public sector, and also hobbyists, but we must at the same time ensure that the regulatory regime keeps apace with these changes to enable such uses, whilst ensuring public and aviation safety and security." Up until recently, Airbus's autonomous flying vehicle project has been kept on the down low. Developers in several countries have taken on various aspects of the flying vehicle project. For example, in France and Germany, Airbus engineers are developing a bus-like flying vehicle under the project name CityAirbus. The flying bus would use multiple propellers and resemble a drone more than a helicopter. The company said CityAirbus would initially be operated by a pilot in order for it to quickly gain market entry, but it would then move to a fully autonomous platform once government regulations catch up to the technology. Airbus's Skyways and Vahana flying car projects would contribute to the CityAirbus autonomous platform. "Our Group's strength is that we have interconnected projects that together are helping to drive the upcoming revolution," Jörg Müller from Airbus Group's corporate development department, stated. "The contribution of Skyways, CityAirbus and Vahana in terms of regulations and public and market acceptance will bring to life the future of smart cities' multimodal transport networks." Airbus sees an autonomous flying taxi or bus operating similarly to a ride-hailing or ride-sharing service; a smartphone could be used to schedule a pickup. "We believe that global demand for this category of aircraft can support fleets of millions of vehicles worldwide," Lyasoff said. "A taxi ride through a new city is a nice experience as it is, but flying over that city would be much more thrilling," said Marius Bebesel, head of Helicopter Demonstrators at Airbus Helicopters. Airbus acknowledged that it is far from alone in its pursuit of a fully autonomous flying passenger transport vehicle. Flying car projects abound, including the PAL-V, Skycar, AeroMobil 3.0, Maverick LSA, Icon A5, Switchblade, Lilium Jet, Pegase Mk2, Skyrunner, Volante Joby S2, Terrafugia TF-X and e-volo's Volocopter. In April, e-volo's Volocopter lifted off for the first time with a human passenger. "This market will develop quickly once we are able to deploy the first vehicles in megacities and demonstrate the benefits of quiet, emission-free air transport at competitive prices," Müller said. "When looking at the transport needs of business travelers to and from airports or between business districts, you quickly realize that the potential demand corresponds to about 100 times the yearly production of Airbus Helicopters. And that this would only require replacing one out of a hundred ground taxis."